I mean ‘basic’ as in my style. I’m not entirely sure what the point of this post is, but I just wanted to share what I tend to wear everyday. This post will include possibly some of the blandest clothing you’ve encountered but in my defence, I’m a creature of comfort. I do like to play it up and experiment every now and again, but that’s not what this post is about. I want to talk about my everyday worn-to-death items and I want to know yours as well. Let’s start with basic tees. I’m that person who will buy the same t-shirt in multiple colours and have no shame about wearing it all week long. When something fits perfectly, the quality is great, I tend to wear it till it develops holes. 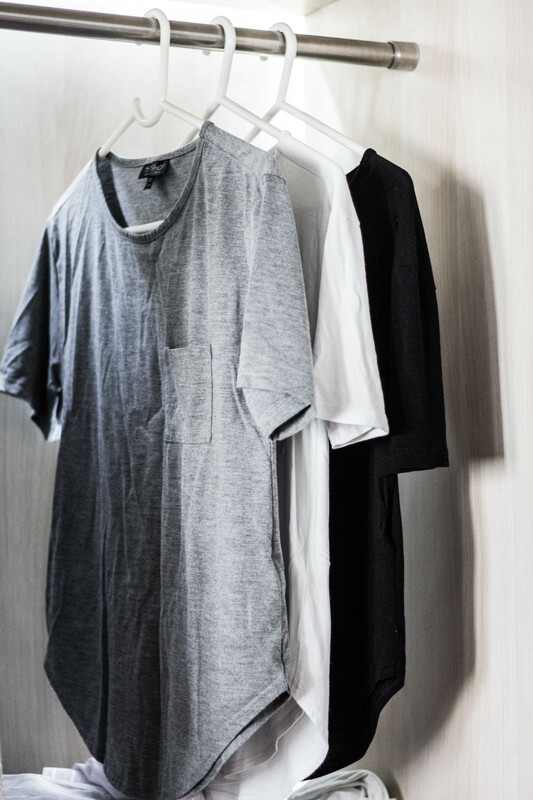 I bring you the Topshop Pocket Tee which I own in white, grey and black. It’s a slouchy silhouette that I’m very much into at the moment. The curved hem does give it a more modern cut. I also have the pure cotton Forever New Navy and White Striped Tee which I bought a in size too large but it shrunk after the first few washes and fits me perfectly now. Don’t you just love it when an accidental purchase works out just fine? To complete this monochrome set I have the Topshop Jamie Jeans in black and grey. Yes, there will be a blue Jamie added in soon because the fit is just perfect. But for now, I’m content with this quite naturally faded Gap True Skinny Jeans which I’ve had for approximately 6 years and are still going strong. With this set, I’m very comfy in my H&M Light Grey Sneakers. I’ve had this pair for over three years and it also survives washing machine cycles really well. Prime examples of rare fast fashion items that last. The dress code at work is pretty casual unless company overlords or clients are visiting. It’s not unusual to see an Angry Birds t-shirts at work. But an absolute essential for me, winter or no winter, is a light sweater because I feel cold quite easily and air conditioning is unavoidable. You never know when you’re stuck in a meeting for three hours, shivering from the AC blasting right onto your face. It’s happened one too many times and I’ve learnt my lesson. My incredibly soft Mango Cardigan in Black is my go to. It’s black, goes with everything and actually makes whatever I’m wearing look more polished. Finally, to add some colour back in my life, I have two H&M Cotton Cardigans in a light biscuit shade and a burgundy. I like to mix and match these depending on what I’m wearing that day. Also clearly, I’m not over fall colours, I don’t think I ever will be. When I need to look more put together, I wear slightly more formal shirts like the Mango Printed Blouse. Predictably, I have two prints, a black on white and a white on black. Another new favourite is the Express Portofino Shirt in Navy Blue which has fold up sleeves. With these I usually pair my Steve Madden Caged Flats in Tan or my Zara Suede Heels in Black. Both are very comfortable although the heels on the Zara are deceptively small and reserved for when I need to look more professional. My trusted accessory for all of the above is my Longchamp Le Pliage in Bilberry. I feel like the dark purple helps give some colour to my usually monochrome outfits and also doesn’t clash badly with any other colour I might wear. It’s also an incredible workhorse bag that you only truly appreciate when you’re caught in unseasonal rains (which are upon my city as I type this). So that concludes my basic wardrobe. Obviously, these are not the only clothes I own. I’m only talking about what I tend to wear everyday and at work. There was a time I would follow trends and try to incorporate them which led to a lot of spending and purchases that I wouldn’t really wear too often. Gone are those days! Now it’s all about comfort and carefully spaced out purchases with just what I need. One can only hope that this will transcend to makeup one day. Let me know what constitutes your everyday style!